VO2 Max Test San Diego | Best VO2 Max Test in San Diego | BodyComp, Inc. The more oxygen you are capable of consuming, the more calories you are able to burn. This figure can fluctuate over time depending on your fitness level. This 10-15 minute, treadmill-based, exercise stress test will tell you precisely that in addition to several other data points such as Lactic Threshold or Anaerobic Threshold, Max Heart Rate, and calories burned, which you can use to train smarter and more efficiently. 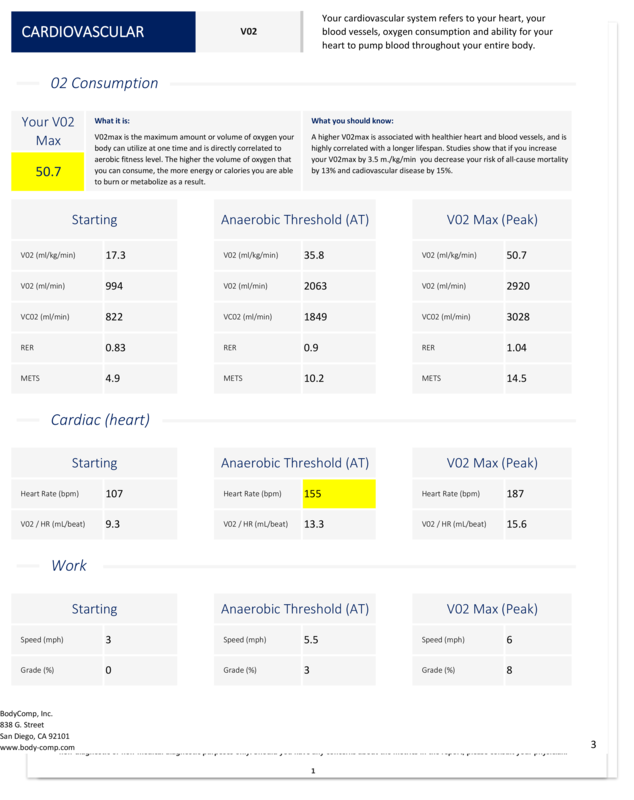 We chose to offer VO2 Max testing so we could provide our customers with actionable fitness data, enabling them to customize their exercise and nutrition programs. We currently employ a MedGraphcis Ultima Series CPX, a true clinical-caliber metabolic cart. You would generally find these in a cardiology department or at a 4-year university. We started in 2014 by pioneering DEXA Scan body composition testing with a mobile business model. In 2017, we added our first brick and mortar storefront in San Diego, which enabled us to offer additional, relative services such as VO2 Max testing and Resting Metabolic Rate Testing (RMR) as an initiative to provide our current and prospective customers with additional resources so they can procure additional information needed to efficiently and effectively work towards their exercise, nutrition, and health goals. A VO2 Max Tests provides you the information you need to optimize your endurance and cardiovascular performance. Train harder and smarter, perform better, burn and use your energy efficiently. We can tell you when you achieve your VO2 Max and Anaerobic Threshold (AT), the point at which you plateau during intense exercise. This exercise and fitness test also determine the number of calories you burn at different heart rates during exercise. Now you can create target heart rate zones for your particular exercises and learn how to optimize fat burn and leverage, maximize your energy and utilization of nutrition and fueling. A VO2 Max pairs well with a Resting Metabolic Rate (RMR) test so you can know your caloric consumption during exercise and at rest. 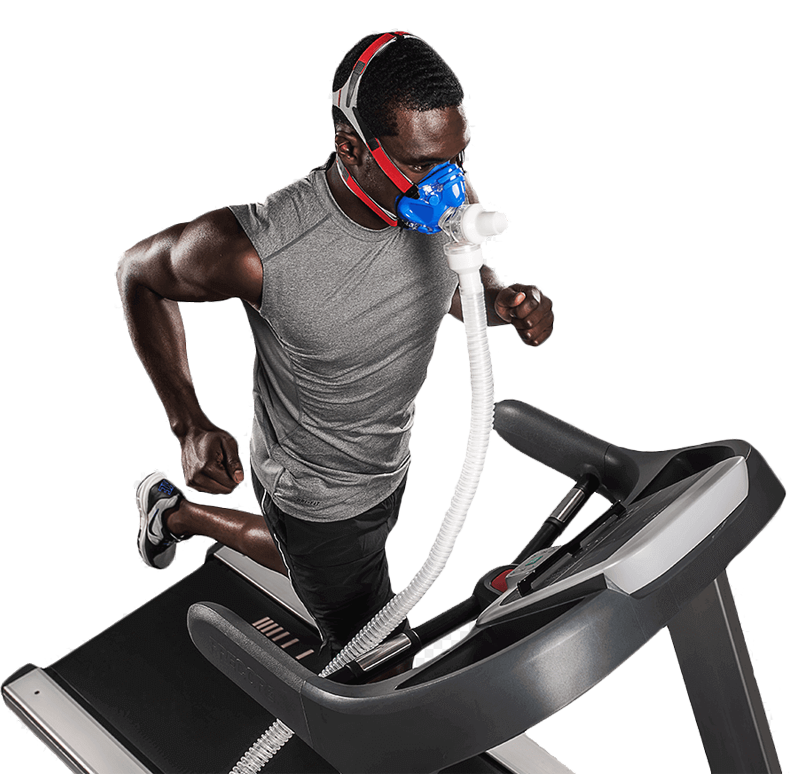 You can book your VO2 Max Test appointment at our Sorrento Valley storefront, buy credits and use as booking tokens at a later date, or purchase an eGift and have it sent via email to a recipient. If you purchase credits, these will automatically populate to your account and can be accessed, redeemed | applied by logging into your BodyComp account. Allocate up to 90 minutes for the entire appointment, which includes (1) VO2 Max, Treadmill-Based Exercise Stress Test, and (1) Resting Metabolic Rate Test. Allocate up to 90 minutes for the entire appointment, which includes (1) DEXA Scan Whole Body Composition, (1) VO2 Max, Treadmill-Based Exercise Stress Test, and (1) Resting Metabolic Rate Test. We offer VO2 Max testing at our San Diego storefront location in Sorrento Valley. The exercise test is performed on the treadmill, so it’s important to be prepared to run. We have a veteran test administrator who has performed hundreds of tests over the past 5 years. We establish a protocol specifically for you and your fitness level. We take safety and quality seriously. You should expect to break a sweat and push yourself to your max heart rate over the course of 10 minutes on the treadmill. You will wear a neoprene face mask and breath through our umbilical cord so our equipment can measure your oxygen consumption. You will also wear a medical-grade heart rate strap so we can measure and record your different heart rate intervals over time. This will enable you to understand your max heart rate as well as the number of calories your burn at each different heart rate. Plan to allocate up-to an hour for your test. A BodyComp, Inc. VO2 Max test measures your cardiovascular fitness level, your ability to consume oxygen, and burn calories. It evaluates at what point you reach max heart rate, anaerobic threshold, and ultimately your VO2 Max. This test is an indicator of your cardiovascular fitness level and aerobic endurance. You are able to better understand your aerobic fitness level and maximal oxygen consumption when you complete your VO2 Max test. Remember, your ability to burn calories depends on your ability consume oxygen. Lactate begins to build in your muscles and you begin to feel fatigue, this happens to everyone at some point during intense exercise. This is a point of max energy output known as your Anaerobic Threshold (AT) and is different for everyone depending on your cardiovascular fitness level. This determination helps you to develop a specific strategy so you can improve your ability to exercise for longer periods of time and at higher intensities. Each person has a Peak VO2, which during intense exercise is the point at which you reach your maximum ability to consume oxygen. This is a volume-based measurement during your breath-by-breath, exercise treadmill test. Unless you’re already an elite athlete, you can likely improve your VO2 Max score by up to 20%. After you have completed your test, you will receive a report that shows your heart rate at different intervals, most notably at the begging of your test (warm-up), at Anaerobic Threshold (AT), and at your VO2 Max (Peak). This information helps you establish target heart rates for your exercise and training programs. Based on your test scores, we will be able to show you how your fitness level compares to your peers from very low to superior, see how you measure up. A fun metric to know is how much of an incline your finish at and how fast you were running. We’ll show you your incline during warm up, at Anaerobic Threshold, and VO2 Max as well as the speed you were going at each level. A BodyComp, Inc. VO2 Max test equips you with the tools and data you need to set goals and accomplish them more effectively and efficiently. Use your VO2 max test results to help you set performance and endurance goals based on your style of training. Learn your fitness level; how fit are you? See what areas you can improve upon and get a good idea of how you would compare to an elite athlete. Use your VO2 Max results such as anaerobic threshold (AeT) aka lactate threshold (LT) and other metrics to fine-tune your programs and get the most out of your time spent training. Track your improvement and progress over time as it compares to your baseline. Use your results to see the correlation between fluctuations and training improvements. Get a good understanding of the number of calories you burn during exercise and at increasing heart rates, including max heart rate. It’s safe to set aside up to one (1) hour for your entire appointment in order to allocate for your warm up and cool down periods. You can expect your treadmill test to take 10 to 15 minutes depending on your current fitness level, required protocol, and warm up time. Your specific testing protocol will depend on your current fitness level. Every protocol will include a warmup and steady increase in treadmill incline and speed until you reach your anaerobic threshold, max heart rate, and VO2 Max. It’s important to note that this test is not intended for individuals who are experiencing health conditions that may impact your heart and/or ability to achieve max effort due to respiratory problems, cardiovascular illness, injuries, etc. It’s best to avoid strenuous activity or intensive exercise up to 6 hours prior. You can optimize your test results by keeping your blood pressure and resting heart rate at normal levels. While it’s ultimately up to you, we don’t suggest fasting before your VO2 Max test because you need energy. Fuel for your test just as you would any other workout. Avoid stimulant substances that can increase your heart rate or blood pressure such as caffeine. Water and hydration liquids are okay. Hydration is important for your VO2 Max Test. Just as you want to be hydrated for normal exercise, you will want to be as hydrated as possible for your treadmill, exercise stress test. Keep in mind it’s a treadmill exercise test, which some refer to as an exercise stress test. You can expect to break a sweat, achieve max heart rate and get a good workout in, so be sure to bring a towel, wear comfortable workout clothes and running shoes. At this time you can choose to get your BodyComp VO2 Max test from the following option..
Book your appointment online to have your test completed at our San Diego storefront in Sorrento Valley.